As promised, here is my recipe for making Japanese style hamburgers or hamburger steaks, one of the quintessential _yohshoku_ or Japanese Western-style dishes. They are called hanbaagu (though they are sometimes called hambaagaa, but that variation usually refers to the kind that comes sandwiched inside a bun) in Japan, and are very popular for lunch or dinner, and are eaten as a side dish to rice (okazu) in Japanese homes. In fancier restaurants that specialize in yohshoku, they might be eaten with a knife and fork, but at home they're eaten with chopsticks. Whenever Japanese food magazines have a poll about popular okazu, hamburgers are always in the top three, especially amongst kids. They don't have much in common with the American style of hamburger, except for the fact that they both start off with ground meat. 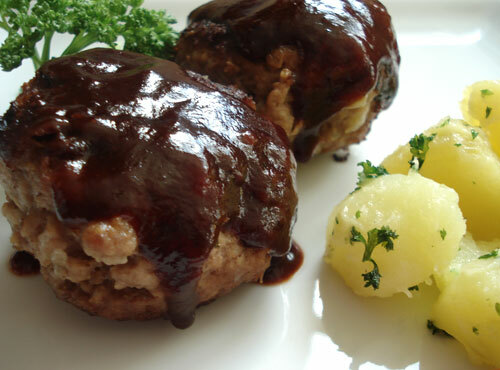 A Japanese hamburger has more in common with meatloaf, and a rather similar texture. They are similar to the old TV dinner standby, Salisbury steak, but I think a lot better. This makes 4 small hamburgers, serving 2 to 4 people depending on what else you are serving. Chop the onion very finely. Sauté the onion in a little oil until translucent. Let cool. Moisten the breadcrumbs with the milk. Combine the meat, cooled onions, moistened milk, egg, salt, ground pepper and nutmeg. Your hands are the best tools for this. Combine well until everything is amalgamated. Notice that the texture is not crumbly. Heat up a large frying pan with some oil over high heat. Place the hamburgers well apart in the hot pan, and fry until browned. Turn over and turn the heat down to low. Put a tight fitting lid on the pan and steam-cook the hamburgers for about 10 minutes until the middle bounces back if you press down on it. Take out and keep warm. Pour out any excess oil from the pan and turn the heat up to high again. Add the red wine and deglaze the pan with it (scrape off the brown bits and blend). Add the ketchup and the Bulldog sauce and blend. Pour over the hamburgers. They are best served piping hot, but they are also very popular for bento boxes. As I've noted above, hamburgers in Japan are eaten with plain white rice. So it's fine to serve them just so on their own plate, maybe with a garnish. A popular side to them is glazed carrots (boiled carrots which are glazed with butter and a little bit of sugar). 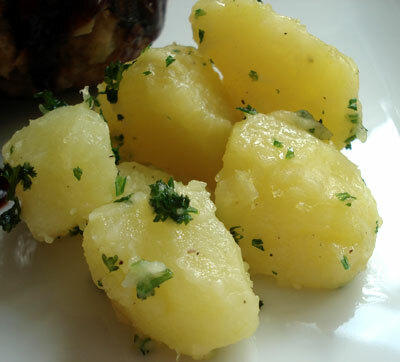 Another popular side is kofukiimo, boiled pototoes that are dried out in a hot pan, and tossed with a little butter, salt and pepper and chopped parsley. 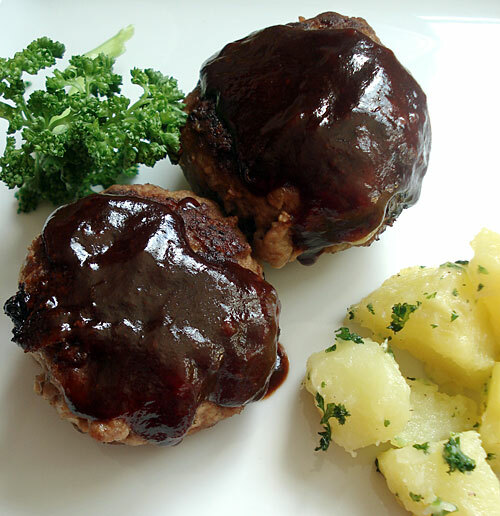 The sauce I've used here is very easy to make and fits perfectly with the hamburgers. Other sauces that are often used include demiglace (most often seen at yohshoku restaurants, though home cooks can buy canned demiglace), teriyaki-style sauce, or just a little soy sauce and grated daikon radish. See the tofu-meat mix variation for hambaagu that are not as juicy, but still good, and which arguably hold up better taste-wise when cooled (as in bento boxes). But really, once in a while you just have to have a real juicy hambaagu. Submitted by maki on 2008-03-28 14:38. These look like a lot of fun to make and eat. I bet they'd go well with your mini pitas as an alternate starch (I make those all the time, these days). My girlfriend and I envision something like Go-gurt, only with ground meat. It's nice to see that you are recovering well and back to blogging. Thanks for sharing this recipe. Gotta try it. It looks delish! Hamburger steak is pretty much a staple lunch "plate lunch" menu here along with beef stew and laulau plate. True, the Japanese version is somewhat more delicate and more like a meatloaf as you stated, I find that true also. As soon as I saw that delightful picture I was sure it was tonkatsu sauce crowning the patty, and indeed as I read further it is. Delicious. There are many okazuyas here, and we each have our own favorite. Mine here is probably Ebisu okazuya. My breakfast would consist of a musubi and a slice of local-style Japanese-inspired omelette, kamaboko included, delicious. Lunch might be hambaagaa local style, cooked in more of a teriyaki sauce, kinpira gobo (one of my favorite foods) and a musubi, maybe little namasu to balance the palette. 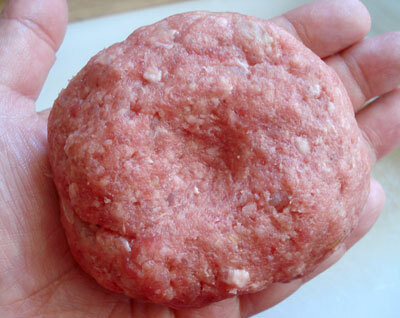 Interesting how the humble hamburger patty is prevalent as a staple in many if not all cultures. Its your basic black, with a technicolor coat. Your hambaagu look really tasty! Would kimpira make a good side dish? To eat with rice, absolutely! Would standard prepackaged panko work here? I like to translate this as 'Hamburg steak,' because saying 'hamburger' gets confusing for us westerners who want to stick it between a bun! When I was in Japan two years ago, I had a yummy, yummy dish of hamburger steak with brown sauce, cheese, and an egg in the center. Is this essentially the same base? I've been hoping to recreate that dish, but I haven't found anything in internet searches that resembles what I had in Japan. Was it a boiled egg inside? If so, you probably had a Japanese version of Scotch Egg I think. You can make it with the hamburger mixture base here, wrapping it around a soft boiled egg (a 3-minute egg). You could add cheese to the filling too though this is not that standard. Then you'd coat it with panko and deep fry it, like menchi katsu. Thanks for the reply! What I had wasn't deep fried... The egg was either soft-boiled and placed into the little indentation, or it was plunked in there and allowed to cook through the residual heat. When you ate it, you broke the yolk so it'd ooze all over the meat as a second sauce. Now that I've managed to get to an Asian store and obtain some tonkatsu sauce, I'm planning to experiment and see if I can recreate the dish somehow. That sounds a classic loco moco! It's actually a Hawaiian dish, but there's a big Japanese influence in Hawaiian dishes, so I don't see why they wouldn't do well in Japan as well. I guess you won't be back to see this, but for others who are curious, look up loco moco - it's really delicious! 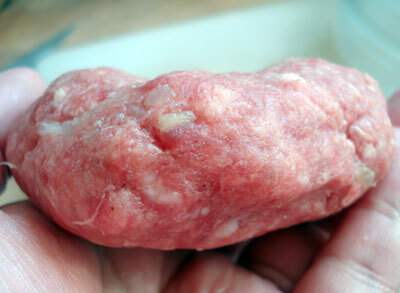 I'm thinking of making hamburgers with this recipe, but can the raw patties be refrigerated for later? Just a day or so because I can't finish that many servings at once but it's troublesome to make it in small portions. I would not refrigerate any ground meat dish that has been handled and is still uncooked for more than a few hours, for safety's sake. You could freeze it though. Feeling nostalgic for foods I tried in Japan, I made these tonight. They turned out great and were a big hit with my family! I could not have imagined that the sauce of simply red wine, Bulldog sauce, and ketchup would be so sublime. Will absolutely make this again. Thank you! Hello. I came across these on the web and I had them when I was browsing your steamed buns (I had steamed buns when I lived in Thailand.) I have a ? here--I don't drink alcohol and never will..and the recipe calls for dry red wine. Can I subsitute that? Also, what exactly kind of soy sauce do you suggest? I have the healthy boy brand here. With the steamed buns, I actually hate shiitake mushrooms. Can I subsitute that with a different mushroom? I just wanted to mention that there is a difference between hambaagu or hambaagaa. Hambaagu is hamburger steak and hambaagaa is a hamburger sandwich. The Japanese have separate words for them. And you're telling Maki, a native Japanese speaker, that because.....? Besides, if you were to actually read the article she mentioned it at the very top. but this recipe was just WOW... excellent! I just made this with ground turkey and it's fantastic. I added some worcestershire sauce to the mix and fried it in olive oil. I also had to add a bit more bread crumbs since turkey is more moist than hamburger. It tastes great! Thanks for all the great bento recipes! Thanks Maki for the recipe! Made this yesterday with ours stuffed with mozzarella cheese and mushrooms, it was really good! I'm going to try to make this -- I hope I find the tonkatsu sauce, bulldog brand. Is there a substitute I could use if I can't find it? Thanks!